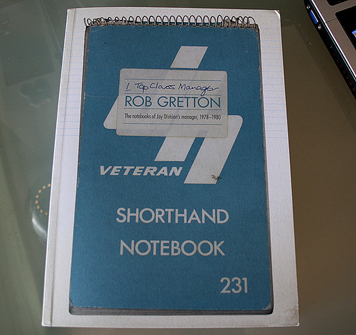 It condenses twenty notebooks into one volume, and also contains posters, letters, invoices, diaries and studio notes, dating from August 1978 to late 1980. It is a full-colour, 220-page softback with a foreword by Jon Savage. Design is by John Coulthart with Lesley Gilbert and Abigail Ward. '1 Top Class Manager' is strictly limited to 1500 copies. To secure your copy, click here. "...the idealism and generosity of spirit encoded within the endless minutiae of to-do lists, PA companies, phone numbers and draft letters to van-hire companies render this lovingly realised tribute an essential purchase, not just for fans of the band, but for anyone with big dreams involving music." "Beautifully laid out, '1 Top Class Manager' really lifts the lid on what Gretton did to become so revered...a labour of love"
"For those still caught in Joy Division's gravitational pull, this is an excellent way to get closer." Please email info@1topclassmanager.co.uk for more information.